Native of Crete in the 13th Century B.C. ; The general populace of modern-day Earth believe the Minotaur to be a fictional character of mythological origin. Aliases: Minotaur translates to "Minos' Bull"
Powers/Abilities: The Minotaur possesses an uncertain amount of superhuman strength (likely enhanced human) and possibly enhanced durability and olfactory senses. It is a savage, unintelligent creature, with hard, sharp horns on its head. History: (Historical myth) - The Minotaur was the offspring of the Queen Pasiphae and the Bull of Poseiden. Her husband, King Minos, had been given control of the oceans around Crete by the divine right of the sea-god Poseiden (Neptune). To show his appreciation, Minos promised to sacrifice the first bull he saw to the sea-god, knowing full well that he did not have one. Poseiden then allowed one to appear, a great white one, but Minos kept it as a gift to himself rather than sacrifice it as promised. Angered, Poseiden instructed Cupid, the god of love, to smite Pasiphae with a love for the great bull. She instructed Daedalus, the royal artisan, to create a hollow wooden cow that she could enter to admire the bull up close. From within it, she became pregnant by the bull which was later captured as the seventh labor of Hercules and taken to Greece. In the beginning, Pasiphae believed the child she conceived was Minos' and named it Asterion after Minos' step-father (actually, Minos' true father was Zeus, Lord of the gods.) Young Asterion however, was born deformed and slowly grew up to resemble a bull. He never learned to talk, possessed a brutal, more animalistic amount of strength and an intelligence slightly higher than most animals. When Minos learned Asterion's true origin, he locked the freakish monster in the catacombs under the castle, and then commissioned Daedalus to further expand the catacombs into a maze so that Asterion, now known as the Minotaur, could not escape. For several years in his war with the Athenians, Minos used the maze of catacombs, now known as the labyrinth, to imprison his enemies for the Minotaur to kill at his leisure. When King Aegeus of Athens killed Minos' son Androgeus, Minos vengefully forced Athens to pay him an annual tribute of seven youths and seven maidens. These he shut in inside the labyrinth, where they either starved or were devoured by the Minotaur. Meanwhile, the legend of the Minotaur spread far throughout ancient Greece, but no one knew of its origins. (Eternals II#5 (fb)) - While in Minoan Crete, the Eternal known as Ikaris fought the Minotaur in the labyrinth. (Historical myth) - Finally, the son of Athenian king Aeseus, Theseus, volunteered to go to Crete and sever the control the Cretans had on Athens. Allowing himself to be imprisoned in the labyrinth with a group of victims, Theseus enlisted the help of Minos' daughter, Ariadne to escape the maze, but only after he had killed the Minotaur and freed his kinsmen. Discovering the mad creature, Theseus fought the bull-man and later ran it through with his sword. Later Greek poets, Plutarch and Apollodarus documented these events, but recent scholars do not acknowledge them as history. (Avengers I#17 - BTS) - The Avengers encountered a subterranean Minotaur serving the Mole Man, whom they suspected to have been the creature which inspired the legend of the Minotaur. (Iron Man I#24 (fb) - BTS) - Miklos Vrylak's father allegedly used chemicals from Crete, associated with the original Minotaur, in an effort to save his son, which turned Miklos into another Minotaur. (Hercules and the Heart of Chaos#2) - Ares unleashed Minotaur on Hercules at his Warhawks base in South America. 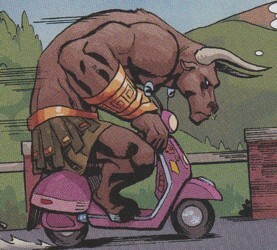 The Minotaur slew Hercules' friend, S.H.I.E.L.D. agent Roger "Buddy" Juniper, before Hercules killed the Minotaur himself. (Wolverine/Hercules: Myths, Monsters & Mutants#2 (fb) - BTS) - Minotaur's corpse was transported back to his original grave within the Labyrinth of Crete. (Wolverine/Hercules: Myths, Monsters & Mutants#2 (fb) ) - Eurystheus and Achelous led Matsuo and the Hand to the Labyrinth of Crete where they found and resurrected the corpse of the Minotaur. (Wolverine/Hercules: Myths, Monsters & Mutants#2 (fb) ) - Upon entering Matsuo Tsurayaba's apartment Wolverine and Hercules were greeted by a video of Matsuo, Eurystheus and Achelous telling them of the resurrection of ancient Greek monsters. Moments later the first two, Minotaur and Nemean Lion, attacked them. After knocking out Hercules they opposed Wolverine. 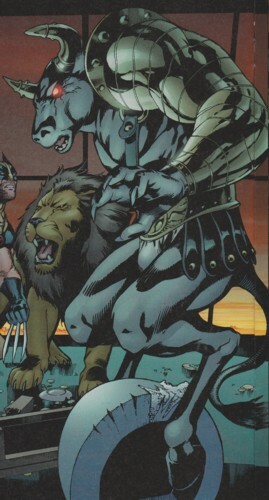 (Wolverine/Hercules: Myths, Monsters & Mutants#2) - Minotaur and Nemean Lion attacked Wolverine. Minotaur explained to Wolverine that his Adamantium claws were useless against the Nemean Lion's invulnerable hide. After Wolverine kicked him in the head and Hercules, who had regained consciousness punched him through a wall, Wolverine took on him and lured Minotaur to rush at him. At the last moment Wolverine ducked and Minotaur crashed through a window and seemingly fell to his death. (Deadpool: Dracula's Gauntlet#2 (fb) - BTS) - Minotaur survived the fall and was turned into stone (see comments) then transported to Papaconstantinos, Greece where it was placed in the center of the city. (Deadpool: Dracula's Gauntlet#2) - When Minotaur sensed the evil Deadpool had brought to town in a sarcophagus he broke free of his stone casing and attacked the Merc with a Mouth, intending to slay the evil within the sarcophagus. Deadpool fought back and was impaled by one of Minotaur's horns. Deadpool's zebra carriage meanwhile ran off and Deadpool quickly got up after Minotaur impaled him and fled from the Greek monster to catch up to his carriage on a stolen moped. Still seeking to destroy the evil within the sarcophagus the Minotaur also stole a moped to follow the carriage. When Deadpool took control over the carriage again he used a red rag to lure the Minotaur to ram the carriage and fall into a river with the moped. Deadpool's plan worked, but the carriage and the sarcophagus got destroyed and Shiklah finally awakened. 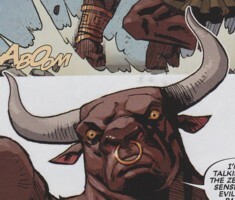 (Scarlet Witch II#2 - BTS) - The Emerald Warlock allegedly imbued Man-Bull with the powers of the mythologcial Minotaur. Comments: Adapted by Peter Gillis and Sal Buscema. Minotaur's return to life in Hercules and the Heart of Chaos#2 was presumably at the hands of Pluto, who was not a fan of Hercules most of the time and had previously been working with Ares. 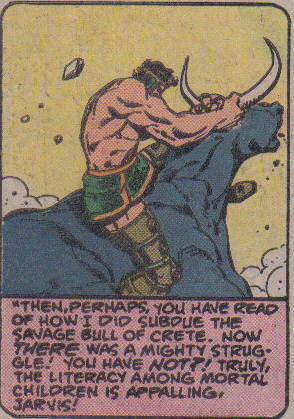 In Wolverine/Hercules: Myths, Monsters & Mutants#2 Minotaur was presumably saved by Medusa. She was another mythological creature resurrected by the Hand and attacked Hercules and Wolverine moments after Minotaur and the Nemean Lion were defeated. Maybe she met Minotaur on his way down or her petrifying glance saved his life when he lay dying on the street. 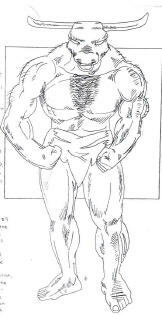 IMHO the Minotaur in Marvel Year-in-Review 1992 was most likely Miklos Vryolak, who was small enough to fit into the bar and did fit the lame villain theme more than the actual Minotaur or the monster from Avengers I#17. I know Miklos was supposed to be dead, but so was Asterion. More than one Minotaur had lived within the Labyrinth. Not only that, but the past history of Ikaris confuses things even more: In the same flashback that relates his conflict with the Minotaur, he relates the story of his son, who was half-human and had no powers. Ikaris--who back then went by a different, unspecified name--built wings for his son. The son one day flew to high without supervision, passed out from lack of oxygen, and fell from the sky to his death. After this, "Ikaris" took his current name in memory of his son (who had been named "Ikaris"). Why is this confusing? Well, my myth knowledge is weak compared to Will, Greg, Nick, and others, but I do remember that in mythology, Icarus' father was Daedalus--the same guy who built the Labyrinth, that contained the Minotaur! So, there's unexplained stuff here, which is likely to remain unexplained. I'm fairly certain that rather than get a definitive answer, we're more likely to get more Minotaurs, many of whom will have been the original. Maybe Ikaris was Daedalus and worked for Minos and saved his wife from the Minotaur, but didn't kill the monster and just left. So, he was not Theseus, the one that actually got to kill the Minotaur. Also, the Iron Man I#24 Minotaur's origins described the obtaining of a chemical from Crete, the very same chemical which had been used to mutate the original Minotaur. That fits with neither myth nor Deviant origin, so who knows? 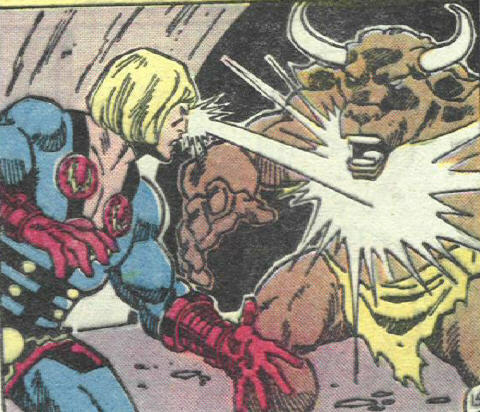 I was originally just going to include all of Will's info as a sub-profile for the Minotaur who fought the Avengers, until I remembered the appearance from Eternals II#5. With the slim pickins' on images for that character, I decided to include a drawing of Will's, which is derived from a drawing of the Man-Bull, from the OHotMU I.
Minos became the most prosperous king of the Mediterranean area, renowned as much for his justness as his power. Along with Aeacus and Rhadamanthus, he became one of the three judges of Hades. The Minoan civilization is named for him. In 1979, in an archeological expedition at Knossos, Crete, a professor of archeology named Peter Warren discovered houses where the top rooms had collapsed into the basement. He found several mundane household objects, as well as a large storage jar containing the remains of foodstuffs, burnt earth, and human bones (a cervical vertebra) with evidence of 'cut marks'. Investigating further into the adjacent room, they found 251 animal bones (sheep, pigs, dogs, etc.) alongside 371 human bones and bone fragments, all of them from children. Most of these human bones also had 'cut marks' on them. Warren speculates that it was some sort of ritual cannibalism, as the marks on the bones looks as though someone was just scraping the meat and flesh off. He believes that some sort of gruesome cult, killed and ate children for religious purposes, giving rise to the legend of flesh eating Minotaur. Also, much evidence has been found that the Minoans engaged in bullfighting for religious rituals, where acrobats would try to leap over the charging bulls without getting impaled on its horns. The labyrinth could have been inspired by the Palace of Knossos which was composed of a vast complex of interconnecting courtyards and apartments. Profile by Will U and Snood. Updated by Markus Raymond (Wolverine/Hercules and Deadpool appearances). The Cretan Bull was a gift to King Minos of Crete from Poseidon, the Olympian god of the sea. When Minos claimed rule of Crete by divine right, he had prayed to Poseidon for confirmation of the claim. Poseidon wanted Minos to sacrifice a bull to him to bind the pact, but Minos didn't own any cattle so Poseidon sent the Cretan Bull to rise up on Crete from the sea with orders for it to be sacrificed. The miracle satisfied Minos' rivals for the throne, but the bull was so perfect that Minos instead found another less handsome bull to sacrifice. In revenge, Poseidon had Cupid smite Pasiphae, wife of Minos, with a love for the bull and she gave birth to the Minotaur as a result. After Theseus, then heir to Athens, slew the Minotaur, the Cretan Bull began terrorizing the island. Hercules was sent out of the Peloponnesus for the first time for his Seventh Labor by King Eurystheus of Mycenae who hoped he would meet dire ends in foreign lands. The Cretan Bull had become an embarrassment to King Minos because of his dealings with it. Minos gave Hercules permission to slay it, but Hercules instead brought it to Mycenae and freed it there out of spite. The bull eventually wandered through Sparta and Arcadia on its way to Marathon where it killed the Cretan prince Androgeus trying to reclaim it. Aided by the sorceress Medea, Theseus recaptured it and took it back to Athens where it was finally sacrificed to Poseidon.